Functional Medicine identifies health as a positive vitality, not merely the absence of disease, emphasizing those factors that encourage the enhancement of a vigorous life. The patient –centered approach is respectful of, and responsive to, individual patient preferences, needs, and values. It ensures that patient values guide all clinical decisions. The power of this therapeutic partnership comes from the idea that patients who are active participants in the development of the therapeutic plan for more comfortable, in control of their own well-being, and are more likely to make sustained lifestyle changes to improve their health. The future is very bright for Functional Medicine. You might’ve heard President Obama talk of Precision Medicine which is another name for Functional Medicine. The Cleveland Clinic has a division of Lifestyle Medicine which is another name for Functional Medicine. Every major hospital treating cancer now has a doctor trained in Functional Medicine. Approximately 30 medical schools have started to integrate Functional Medicine into the curriculum. Even the World Health Association is interested. The most important factors, and the ones that examined first when gathering information about the patient, are the foundational lifestyle factors: sleep, exercise, nutrition, stress levels, relationships, and genetics. For analogy consider a tree. The roots and soil are the foundational lifestyle factors which are influenced by specific predisposing factors, discrete events, and ongoing physiological processes, which may then result in fundamental imbalances at the trunk of the tree. These imbalances can eventually result in signs and symptoms that are grouped into a diagnosable constellation that we call disease, represented by the branches and leaves of the tree. Conventional healthcare tends to look at the constellation of symptoms first (the branches and leaves), which usually results in a disease diagnosis. Often, this diagnosis is associated with the drug or drugs that can be prescribed to treat this constellation of symptoms, and that is the end of the story. This approach neglects the more fundamental aspects of health that reside in the roots and the trunk of the tree. It treats patients presenting similar symptoms in the same way and completely neglects both the inherent differences among patients as well as the myriad possible causes of a ”disease” can have. 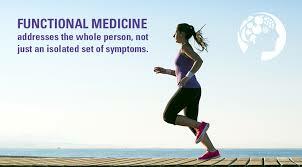 With that said, Functional Medicine does not replace your primary medical physician. In fact, I suggest my patients be under the care of her primary medical physician. Coordinated care with your physician is very important. As your health improves your primary health care physician may reduce or eliminate some of the prescribed medications. The concept of Functional Medicine is new and many people are not clear of what it is. I hope this short article clarified this new form of healthcare. My initial evaluation is usually 80 minutes. As an introduction, I have developed a shortened version of this evaluation for $100. You will receive the same intake information and evaluation used at the Cleveland Clinic. You will also receive a 15 minute explanation of the results of the evaluation and you will be given a copy of this detailed report to take home. Please call my office at 516-922-1699 to make an appointment.